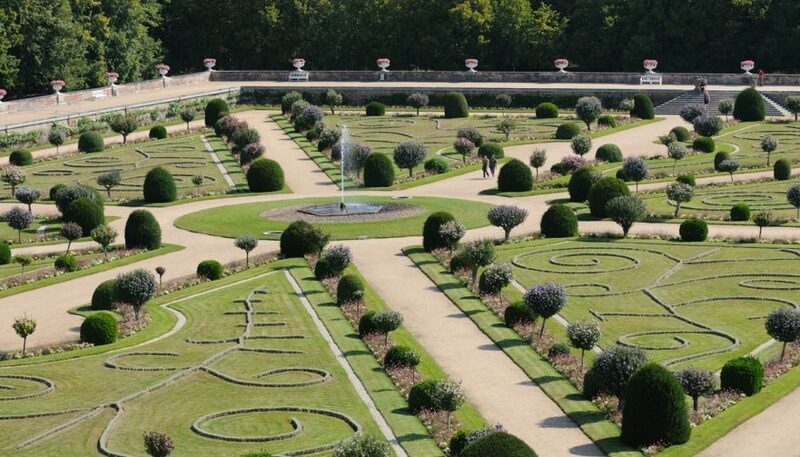 This garden is overlooked by the Chancery, which was the home of the Steward to Catherine de Medicis. Two perpendicular paths and two diagonal paths delimit eight large triangles of lawn decorated with curving scrolls of santolina shrubs. The original fountain has been restored to the centre, as in the time of Diane de Poitiers. The raised terraces, which protect the garden from the Cher when in spate, are punctuated by ornamental basins, and offer views over the yew, spindle, box and laurustinus bushes that line the flower beds More than a hundred hibiscus stems flower here in the summer. Between these bushes, the flower beds emphasise the rigorous geometry of the garden. On all sides, climbing Iceberg roses adorn the terrace walls.